For me are two clear paths: one for the book lover, and another for the ones who prefer video instructions. I would suggest to start with this particular book, to obtain a good methodological introduction and a panoramic view of the plots and effects we can achieve with coins. Also, in the last chapters we have a great exposé of the variety of gimmicks, boxes and accessories (such as handkerchiefs, thumb tips) that we can use in our routines. This should be our second book, in which we find an excellent recompilation of the techniques, effects and concepts from the greatest magicians of our time. In this book we are going to learn effects and a high effective array of techniques, some of them really creative ones, that will serve well in our coin magic arsenal. A highlight from this book is the study of the Retention Vanish Clip, one of the best vanishes (at least for me!) and the one I currently use in my performing repertoire. 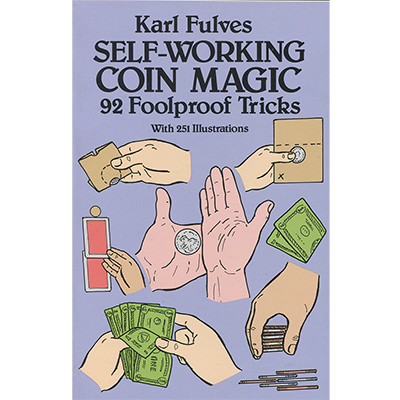 We are going to have our Master Degree in Coin Magic from the hands of Mr Kainoa Harbottle in this inspiring and thrilling book. I strongly recommend the study of the Fan Steal and the Deep Edge Grip, my particular favorites and the ones who gave a breath of fresh air to my repertoire. He is a master in every magic area, but the best thing is that he is an excellent and wonderful teacher. Here we are going to learn the building blocks of a bridge that leads us to the land of EFFECTS, in which we can joyfully explore our new skills and have fun with our future four best friends. This two volume saga is without a doubt the best video collection of coin magic I ever have the pleasure to see. David is also an excellent teacher and have this Hollywood Star touch that inspire us to be like him. In the first volume we submerge a little bit more in this magical sea of silver dollars while reviewing the basics, in a fun and entertain way. After we learn a technique, David show a full routine, so we can learn the proper way to handle the props, routining and above all the PATTER, and the way we can enhance our magic with the right word in the right time. Don´t believe that some of the routines are just to explain the technique, EVERY ROUTINE of this dvd is workable, practical and WORTH LEARNING. Well boys, now that you are part of the inner circle, prepare to drive, work, eat and even sleep with four coins in classic palm. Quick confession, in my insanity I scotch taped four coins to my palm to find out if I get used to the palm. As you have guessed, the only result I got was a mess in the morning, but a great lesson I discover that day. The reason my girlfriend doesn´t like to sleep with me. Enough jibber jabber! Lets get to work. In the second volume we will find again the great Leonardo Di Stone with some great lessons in angles and managing spectators with a full set of incredible routines. Practice them all, except the hidden effect Smile Land, that one is actually impossible. No Coin Magic education can be complete without one of the greatest coin workers of all time. Not my opinion actually, this being said by some guy called Dai Vermen, or Vermon or something to a young David in the Magic Castle of Los Angeles, in a warm spring of September, 1952. As I said, ANY coin magic education is far from complete without studying or at least listening David´s words in the matter. In this volumes we have a master class with a great set of techniques, ideas, routines, original effects and more! That’s all folks! This are the two roads to the most painful blisters of your magic life! That being said, a little help for those who made it this far, whatever path you choose, I recommend you the Best of BOTH WORLDS, don´t overlook Coins on Edge and Le Magie Des Pieces. Don´t be lazy, and try them all, you will find some real gems there. Best luck with your journey! What a great post! I would add Roth's "Ultimate Coin Magic Collection" DVD's for students who want to study further. Harry Loraynes' Magic Book was cited by David Stone as being very helpful for him when he first started out doing coin work. I would put the David Roth book before Kainoa Harbottle. Yes, the Kaufman book is a great one. But for a beginner, the Harbottle stuff is so difficult that it could discourage a person. Just an opinion, of course. Your list is a good list of coin magic. but, in my opinion, it isn't a good list for beginners. To start in coin magic you will need to devote at the very least two years (or more) on coin sleights/moves and especially on palms. It takes a long time to have a NATURAL classic palm. Start with doing finger palm vanishes and some others that don't require a classic palm. Truth be told, a good finger palm vanish and an intelligent use of ramsay palm are very convincing! well this is more a life path!! the way to start are the first steps i tell , but of course taht 1st steps are gonna be super hard to clim you need years!!! , on bobo, easy to master money miracles, and le magie des pieces vol 1, there you have how to start and there you have ALL the palm and concepts of a good basis on coin magic! Eric Jones Metal series was an invaluable teaching aid for me. I don't think it gets enough respect. Likely on account of him partnering with Elusionist and them having the exclusive rights to it. They're a terrible company but his work is quite excellent. To be fair to Mr. Pierri, he laid out the books in order of beginner, intermediate and expert. So comments to the effect that his recommendations are too difficult for beginners should bear that in mind. I would second the recommendation of David Roth's "Expert Coin Magic". It is excellent and wonderfully illustrated. A must for the coin magi. Bobo is filled with routines for people just like you. I know you can finger palm, anyone can. So start with basic stuff and it will get more comfortable over time. It is nice to know a few coin tricks that use quarters and such because they can be performed on the spur of the moment when someone says "show me a trick". I'm not going to give any recommendations but I decided to go with David Roth's dvds. I did coin magic for several years back in the 90's but it's been so long that I'm starting from scratch again. I've only been at it a few weeks but I really the first dvd and I've progressed much faster with coins than I have with cards, I think due to Roth's simple, systematic approach. For a complete beginner I would tend to go with luigimar's suggestion and read the Karl Fulves book. There is also a very good section on coin magic in Harry Lorayne's THE MAGIC BOOK that is well worth checking out. However the real Bible of coin magic is the Bobo book. After that you hardly need anything else! I think Al Schneider books and DVDs are another great option. This is a great post! Obviously you put some thought into it. I am sure that this will save some people a lot of headaches and time. I really enjoy when a post like this gets started. No insulting any one, no flaming topics. Just great advice and more great input from others. I also highly recommend Bobo. And, for the beginner, Introduction to Coin Magic by Shigeo Futagawa. Agreed! I had been working with Eric Jones' and David Roth's stuff as well as Bobo, of course. And then I branched out to Kainoa and others. But it wasn't until I read Al Schneider's On Coins that I developed the ability to perform truly deceptive coin magic with the simplest of transfers and vanishes. Oh, and for a third penny - the DVD of the Bobo stuff, performed by Ben Salinas, is truly awesome. That's the way I feel about cards:-P. I started with coins and it's always seemed to come naturally to me. But cards? I don't know what it is, but there are just some things with cards I can't seem to get. I just assume (being a coin guy) that it's going to take another several hundred hours of practicing .